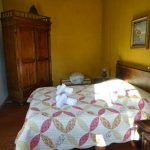 Single Supplement – We cannot guarantee single rooms, but if available we will offer them to you at no extra charge. Set departure dates throughout the year. Private group dates also available on request. Included – All riding, accommodation, meals, snacks, guiding, back up vehicle and airport transfers. Excluded – Flights, soft & alcoholic drinks (alcoholic package $110 soft drinks package $60 paid at start of ride) and tips. International flight to Florianapolis Airport. You will be picked up at the airport on arrival and transferred to the first fazenda and vice versa on return journey. 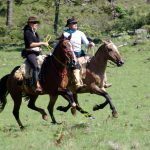 The ultimate trail blaze for riders looking for a truly exciting experience living the gaucho way of life and riding gaucho style. 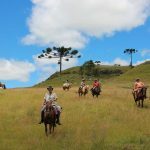 Brazil offers a landscape diverse and beautiful as a backdrop, and the chance to sample the real gaucho world, and make no mistake, this is for real! The hardened gauchos and their agile beloved “Criollo” steeds make a formidable combination in the environment of their work. The “Gaucho do Brasil,” the legendary South American cowboy, refuses to break with tradition which makes for; dixit UNESCO: the gaucho way of life the liveliest equestrian culture in the world. The Brazilian Gaucho lives in the southern states of Santa Catarina and Rio Grande do Sul and all have roots in Europe due to the large numbers of immigrants who arrived in the 18th & 19th centuries, pioneers mostly from Portugal, Spain, Italy, Germany, Austria, Holland and Belgium. 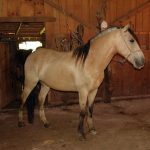 The “Criollo” horse is just as legendary, an intelligent animal with unequalled stamina as well as being fast and highly agile and a joy to ride. If you are dreaming of a unique equestrian experience and a thoroughly authentic riding holiday…… Well, this is it! 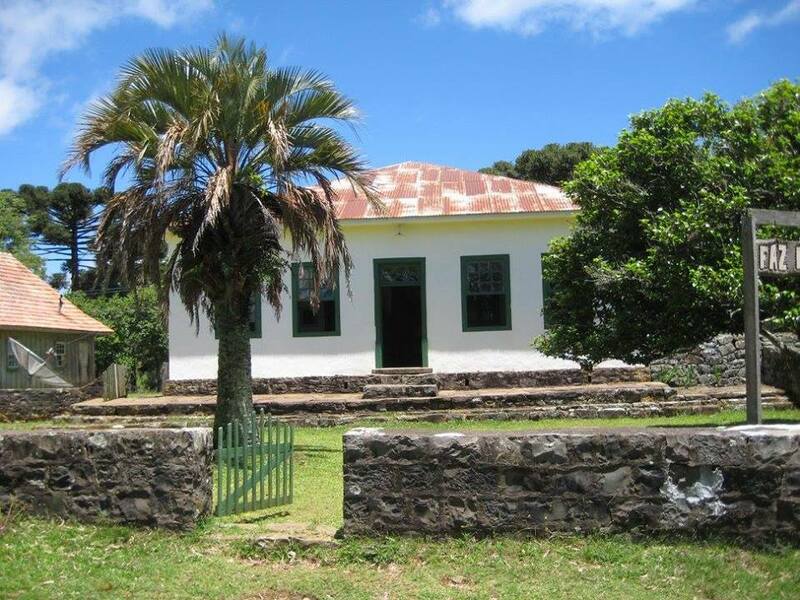 The locals of Santa Catarina will welcome you in traditional style! And this is just the start……. 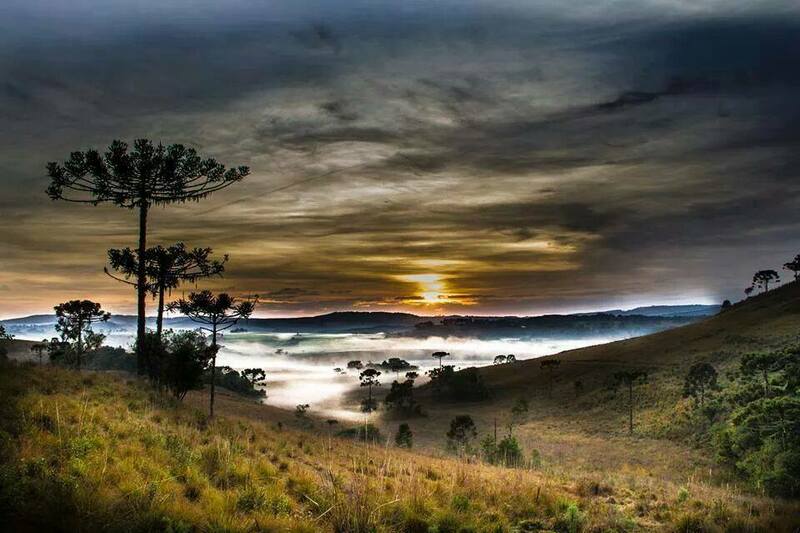 The adventure starts in Coxilha Rica, a high plateau in the interior of the Southern state of Santa Catarina. 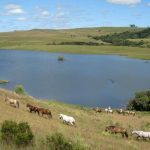 Here at an altitude of about 1000m above sea level, in the heart of gaucho territory, you will be welcomed with open arms on an old fazenda (Brazilian for hacienda) by Paul and his Gaúcho friends. Flemish born Belgian Paul Coudenys, is one of the pioneers of the international equestrian tourism in Europe. 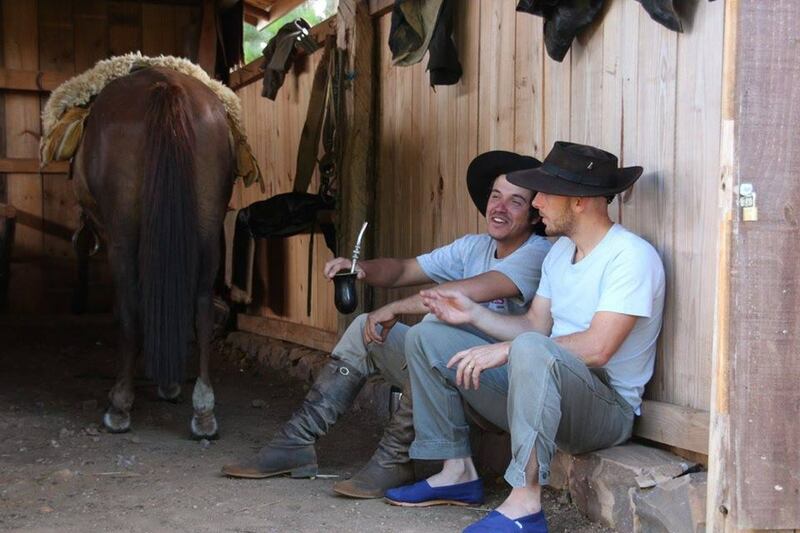 Paul, together with his gaucho companion Roberio will be your host and riding guide during your entire riding holiday. For eight (8) days you will be immersed in the most wonderful horse culture in the world. 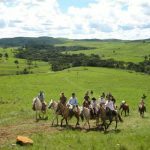 After a traditional first night at Fazenda do Barreiro we will saddle up our criollo horses (very comfortable authentic saddles) and leave for a 6-day trip from fazenda to fazenda. 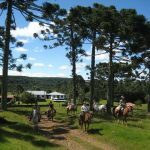 (8 days / 7 nights / 6 days on horseback) The beauty and huge expanse of the pampas with its rolling hills is difficult to put into words. 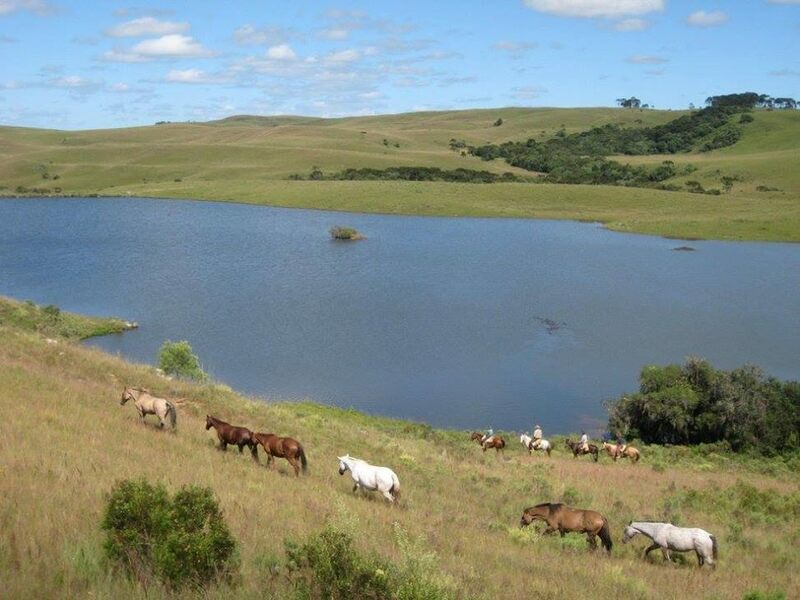 Livestock farms (fazendas) with thousands of acres are the ideal playground to test the temperament of your criollo horse….and there are no roads or paths to follow, just simply pull yourselves across the great outdoors at a gallop or a canter.. … your riding dreams will all be realised. 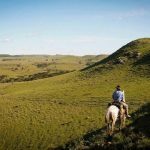 On average, we will be 6 to 7 hours per day in the saddle, make our way across rolling grasslands, riding through Araucaria forests, crossing pristine rivers and, in general, off the beaten track of southern Brazil. This is gaucho country so should we come across a cattle “round up” we will be happy to help. What is work for them is fun for us! 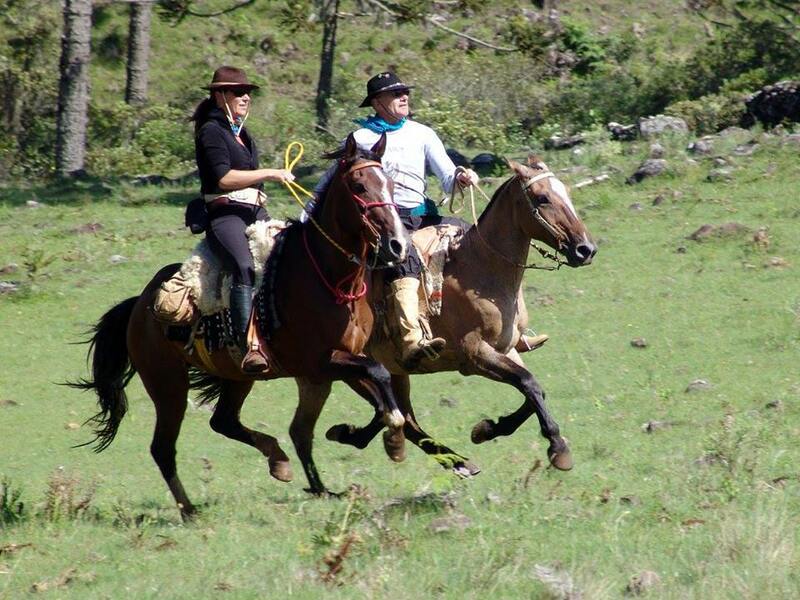 During the “cutting” (sorting the cattle on horseback) you’ll be surprised at just how agile your criollo horse is! 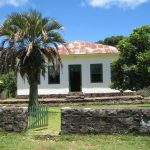 Every evening means a different fazenda, colonial fazendas where time has stood still with rooms filled with antique furniture and large country kitchens, a perfect atmosphere to sample the local brew Chimarão (maté, a sort of tea) and Pinga (local rum). Gauchos are not only tough men, but also romantic souls. Guitar and accordion will appear more often than not and the serenade is of lost loves and the good old days, this while mama is roasting the best meat in the world . A fantastic relaxed gaucho atmosphere, which is pure and sincere. Multilingual Paul guides you through each experience and answers all enquiries whilst leading you through this unique experience. This is not a tourist trip where you’re just a number … but a gathering of riding friends among themselves. With pride, friendliness and hospitality the gaucho families open their doors for you, let you ride their best horses and guide you in their territory. Riding the gaucho way, living the gaucho way! 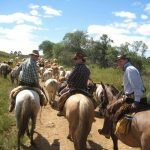 Not a “nose-to-tail” riding experience, but a trail ride for riders looking for a truly exciting and challenging Gaucho experience! Welcome to the world of “Gaúcho do Brasil”! Paul Coudenys, originally born in Belgian, at the age of 21, travelled backpacking around the globe, 3 years later and with a luggage full of travel and riding experiences he returned to Belgium. During his “long journey”, he worked as a blacksmith shoeing horses at the polo club in Singapore and cowboy at a cattle station in Australia, then became a gaucho in South America and as a rider in too many other places and countries to mention. In 1996 he founded “Hippo-Trek” and became one of the pioneers of worldwide riding holidays in Europe. 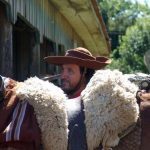 Paul rode horses in 53 different countries and is in our opinion one of the most experienced trail riders in the world. Loving the great horse culture and hospitality in Latin America Paul decided to move to Brazil in 2010. He lives in the southern state of Santa Catarina, home of the South American gaucho (cowboy). 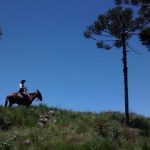 After years of experience in organising and guiding equestrian holidays and riding expeditions around the world, he now concentrates on trail rides and equestrian tourism in Latin America. He speaks 6 languages, loves life, is a very social person and knows like no other how to take you on a ride on the wild side! 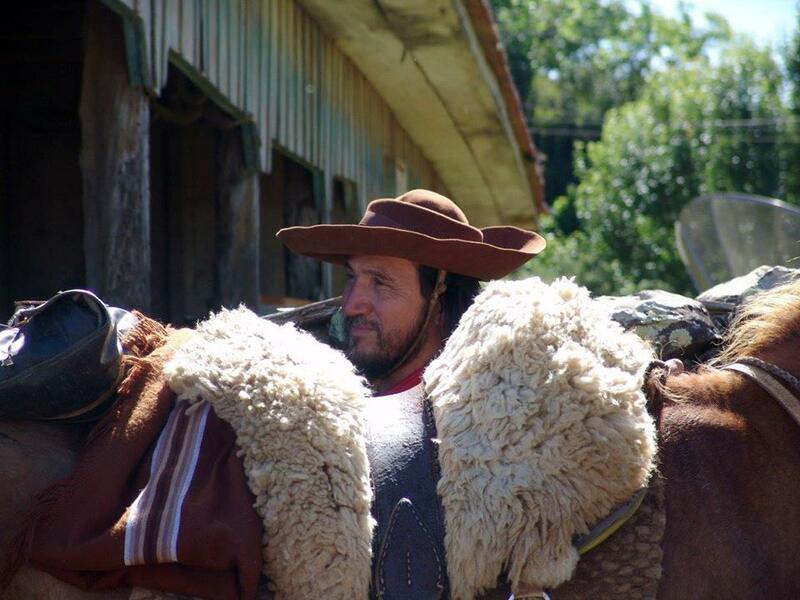 Zara’s Planet is excited to work with Paul and having ridden with him ourselves, we can’t think of a better guide in South America to entrust our clients. 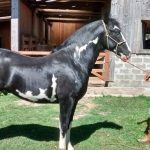 Horses – There are 35 well trained criollo horses for you. The Criollo (Crioulo in Portuguese) is the native horse from Brazil, Argentina, Uruguay and Paraguay. 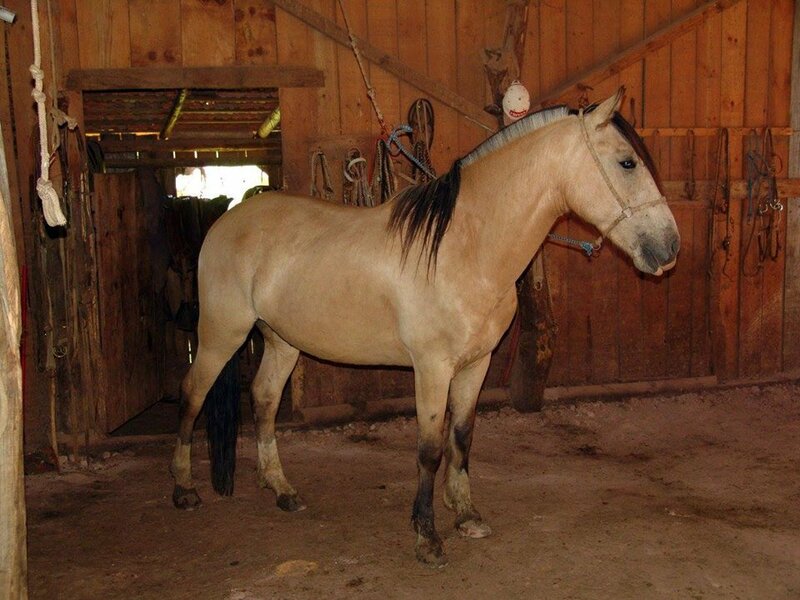 The criollo is a hardy horse with a brawny and strong body. They have short, strong legs with good bone, resistant joints, low-set hocks, and sound, hard feet. The long-muzzled head is medium- to large-sized and has a straight or slightly convex profile with wide-set eyes. The croup is sloping and the haunches well-muscled, the back short with a strong loin. They have sloping, strong shoulders with muscular necks. The body is deep with a broad chest and well-sprung ribs. The criollo is tractable, intelligent, willing, and sensible. 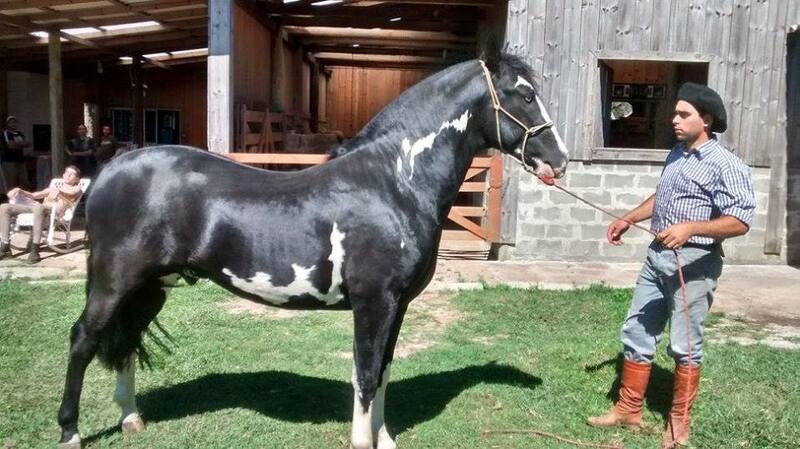 Criollo horses average 15 hands high. Level of Riding & Pace – Intermediate to Advanced. You should be able to control your horse at a gallop in open countryside. Tack – Western style tack and riding. The saddles are authentic gaucho style and incredibly comfortable. Weight Restriction – 120kg / 261lbs / 18 stone 9lbs. Group Size – Maximum 16 – It’s a big group size, but works extremely well, with 4 guides to the group. The horses are all well socialised with each other and it’s a pleasure cantering and galloping in a group of this size. All the fazendas have been carefully chosen for their individuality and charm. They all have incredibly friendly owners that are excited to see you and show you round their homes. 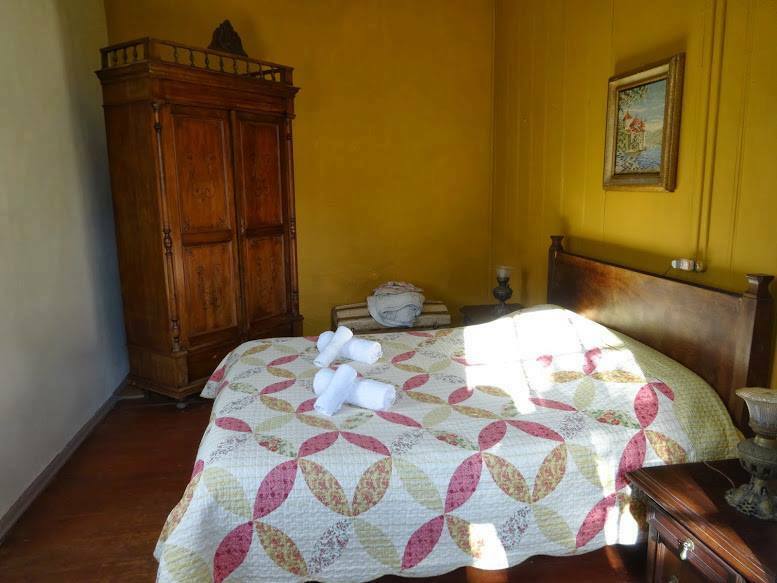 We stay in guest rooms at the house of our gaucho families. 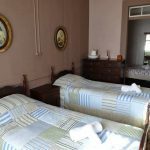 One fazenda might be a bit more simple than the other, but all fazendas are authentic, colonial, cosy and very clean. The fazendas do not all have a standard type of room. 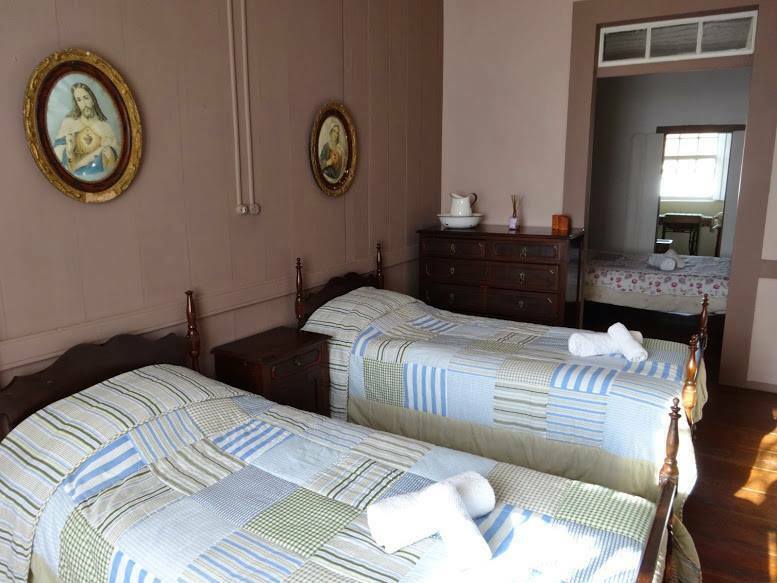 Most rooms are double rooms, some fazendas also have 4 bedded rooms with a connecting bathroom. Brazil has a rich cuisine. The country is a mixture of European, Indian, African and Asian cultures and is reflected in the way the Brazilians cook. Especially the Italian and African cultures which have great influence on Brazilian cuisine. The main dishes are mostly rice and beans (Feijão) and sauces, with lots of meat or fish and salads. From region to region one has its own traditional dishes. Along the coast you will find more fish and shrimp dishes, in the south the tasty meat grill’s (Churrasco) will surprise you. 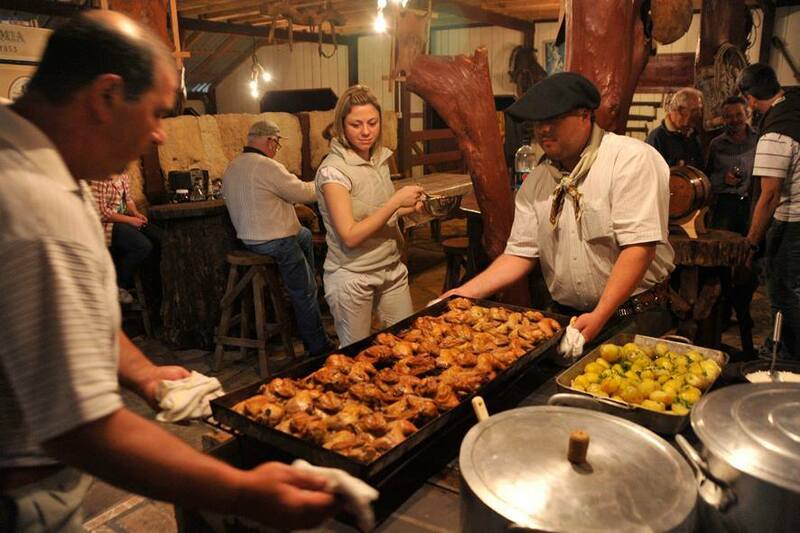 In Santa Catarina real healthy country meals are often prepared on wood stoves, what gives a special extra flavor. During our holiday we eat delicious homemade Santa Catarina dishes at the fazendas. Breakfast, lunch and dinner at the fazendas. Your “Gaúcho do Brasil” trip leader Paul will be waiting for you upon arrival at the airport of Florianopolis. Transfer (3hrs drive) to Coxilha Rica and Fazenda da Chapada near Lages. You will be welcomed with a local drink upon arrival at the fazenda. 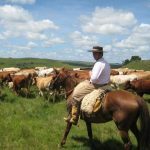 You will be introduced to Daniel the owner of the farm and the Gauchos who will accompany you throughout the trip before settling into your cosy and comfortable rooms of the fazenda. After a delicious dinner and drinks with the group. 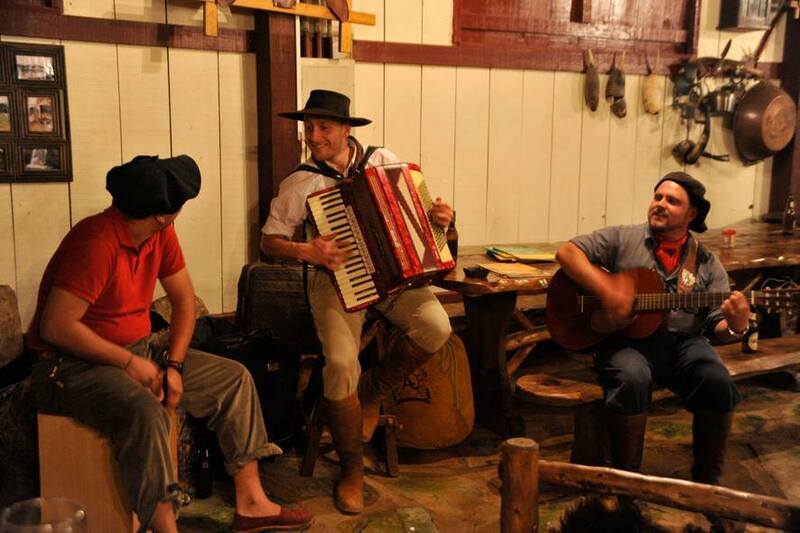 Local gaúchos will perform music and folklore of the region. It’s a great first evening! 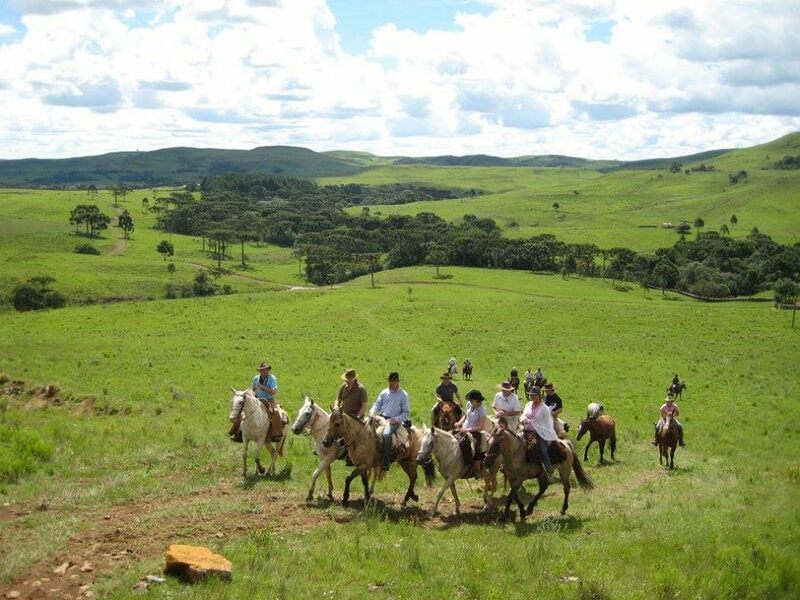 After breakfast, we saddle our horses early and leave around 09:00 in the direction of Fazenda Rodeio Bonito. 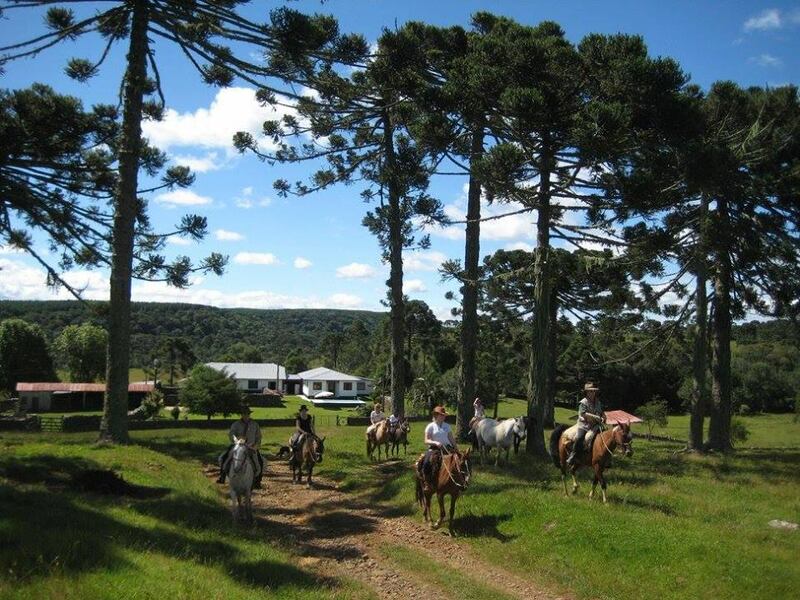 After just minutes you will notice how beautiful the region is, we ride through wide and rolling green countryside dotted with Araucaria trees and cross pristine rivers. You will never forget your first canter with your criollo horse. After a ride of 4 hours we arrive at a typical fazenda where lunch is waiting for us. After a good meal and a siesta we mount our horses again around 14h. 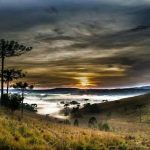 We continue towards fazenda Rodeio Bonito through the beautiful landscape of Coxilha Rica. Here we find the well-preserved colonial Tropeiro Route. This 250 years old tropeiro route was the route of cattle and mules between Rio Grande do Sul and Argentina to Sao Paulo. Gauchos drove herds thousands of kms being away for months via this route. Goods on livestock travelled along the route, so the tropeiro became also a trade route, consisting of an approx 4m wide corridor made of stone was built by slaves. The corridor runs hundreds of kilometers through Coxilha Rica and the State of Santa Catarina. Tropeiro means Trooper. (The route of the troops). We follow a few miles this historic route and arrive around 17:30 at Fazenda Rodeio Bonito. We are welcomed by the owner Lucia. A hearty and delicious dinner is prepared for us. 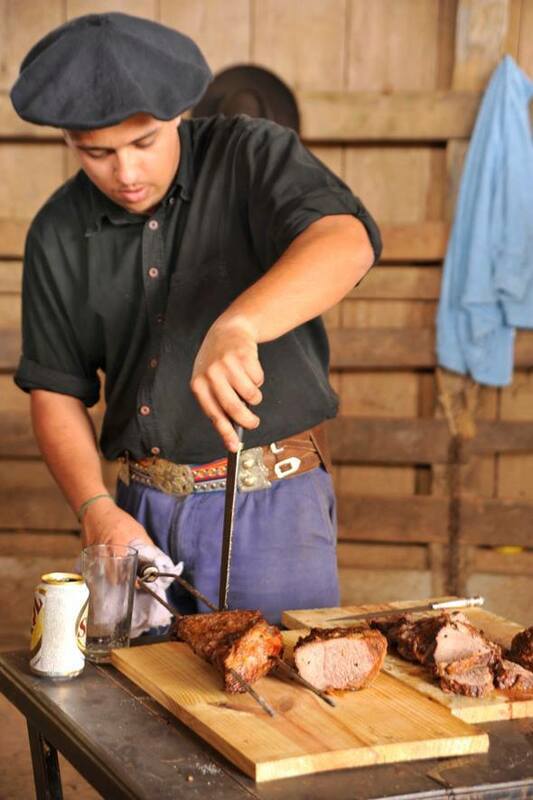 We spend the night at this traditional Gaucho fazenda. 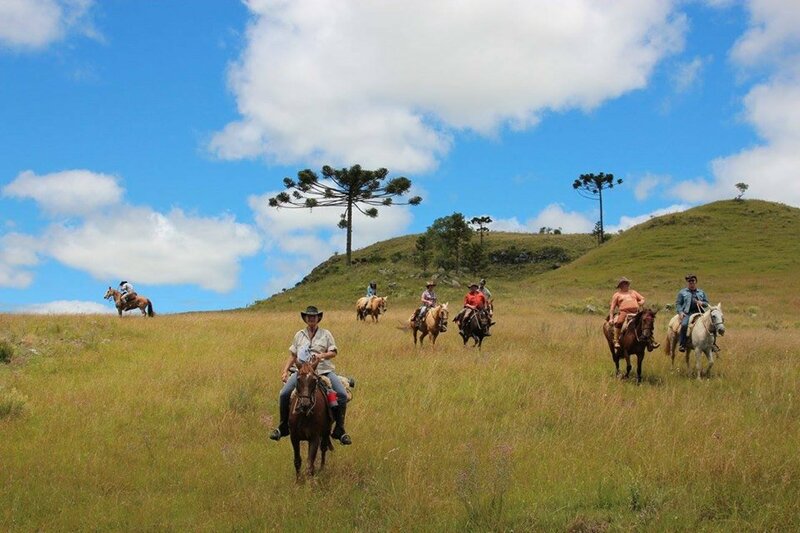 09:00, after a hearty breakfast we mount our criollos and trek through a rugged Coxilha landscape. We climb and descend, trot and canter, crossing rivers and seeing waterfalls. On top of a green mountain you have a fantastic panoramic view of the landscape, just you and the great outdoors! Coxilha since colonial times is a great cattle region. 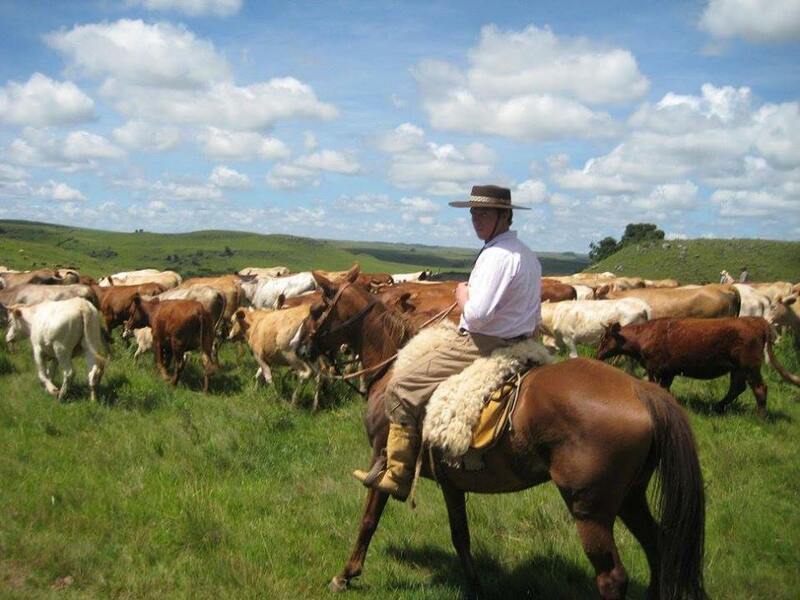 Most cattle ranches (fazendas) consisting of thousands of acres are already over 200 years old. We arrive at a little farm where Dona Vera has prepared a fantastic lunch. In the afternoon we ride another 3 and half hours until we arrive back at the the Fazenda Rodeio Bonito. After a refreshing shower and a delicious dinner, a soft bed awaits for you at this very cozy fazenda. 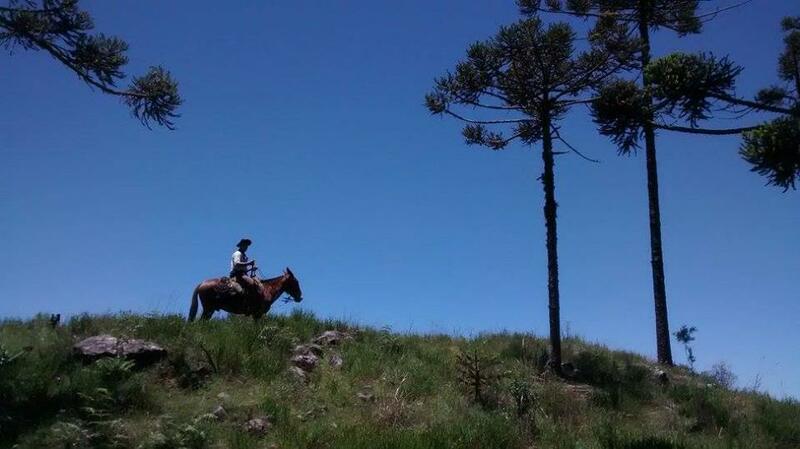 We leave on horseback at 09:00 heading for the high pampas of Coxilha Rica, the views are wonderful. The group of horses, the Gauchos, the landscapes, the atmosphere in the group, the sense of freedom, … nobody wants to travel back home after this trip. After a lunch in the field we continue our ride to the next fazenda; Fazenda Lua Cheia where owners Dido and Sonia have prepared the best roasted lamb in the world. Dido is a vet and loves to BBQ and prepare meat. We make it cozy with a drink and some life Gaucho music! After breakfast we saddle the horses and leave for another great day in the saddle. We regularly ride into other gauchos who are busy at work. These South American cowboys still live and work the same way as roughly 100 years ago. Gaúchos and horses living their lives together, living as we can only dream of .. Climbing and descending, one slope steeper than the other, we often canter off in groups or as we wish. The horses are really fun to ride reactive and easy, just as their gaucho partners have trained them. We arrive at Fazenda Ferradura and are welcomed by the owner Gaucho Benjamin Krüzen. A hearty and delicious dinner is being prepared for us. 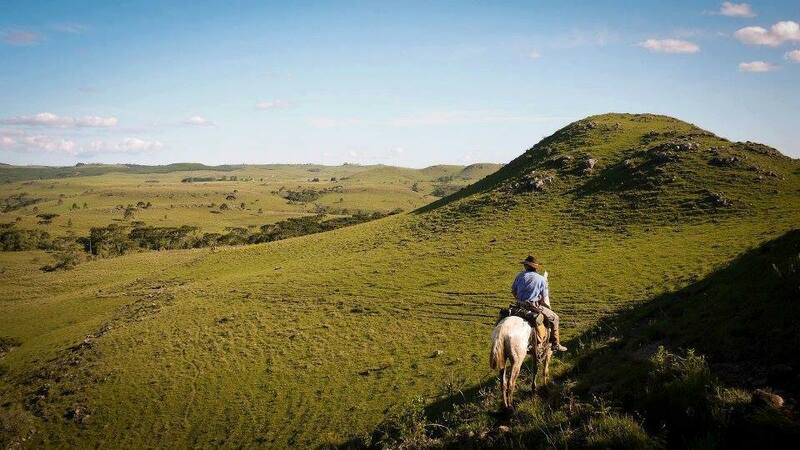 We spend the night at this traditional Gaucho fazenda. Dinner at the fazenda. 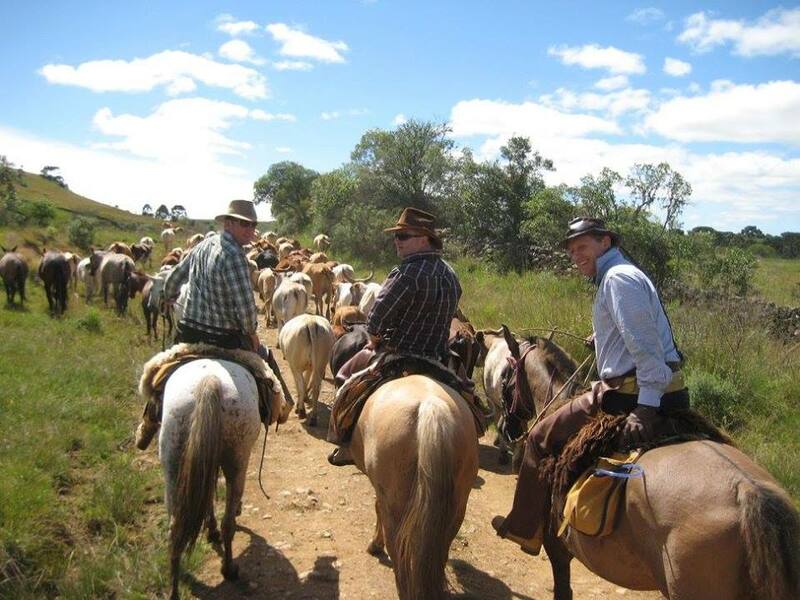 After breakfast we depart for the last day in the saddle, a good ride until we arrive at Fazenda da Chapada. Daniel, the owner of the farm welcomes us back with Caipirinha & hugs. 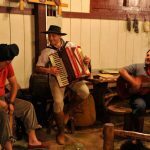 The ladies of the house makes us a delicious dinner while the musically talented gauchos bring their best songs, guitar and accordion into the barn. The bottle of Pinga is eagerly passed around and sometimes we dare to dance! It’s always such a pleasant farewell evening, we enjoy the warm gaucho atmosphere and forge friendship with the locals. Overnight at the fazenda. After our last breakfast around 08:00 we say goodbye to Fazenda da Chapada, the guides, gauchos and horses and drive around 08:00 (depending the flight) back to Florianopolis. People staying longer can have a drop off downtown Florianopolis.